Iridium - Very Much an "Identified Flying Object"
Occasionally something in the sky will catch your eye, like a slowly moving light that gets very bright and then fades away, all in the space of about five seconds. 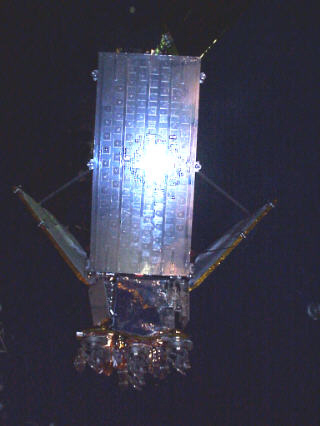 The chances are that you have spotted one of the sixty or so "Iridium" satellites in orbit. The table tells you which direction to look and the maximum brightness (Visual Magnitude) to expect. The more negative the figure, the brighter it will be. For comparison, the brightest stars in the Sky are magnitude -1, Venus at its most brilliant is -4. Sometimes the flare will be a little brighter or dimmer than expected because of minor deviations in the satellite's orientation. Times are local UK so will show Summer Time when it is in force. Iridiums are fitted with a large, flat and highly polished panel behind behind each of their three aerials. They can occasionally produce glints that nearly rival the Full Moon in brightness. Because of the very controlled way in which way the satellites orient themselves in space, Iridium 'flares' are highly predictable. Those in the know can wait for them and can be looking in the right direction when they occur. The data for these predictions are provided by Simone Corbellini, a mathematician and satellite observer who lives in Italy. His own website, Satflare.com, covers satellite observing and flares in more depth.